No other feline expression touches humans on quite the same level as that of a cat's purr. A purr can be felt but not heard, or rumble with the gusto of a Mack truck. 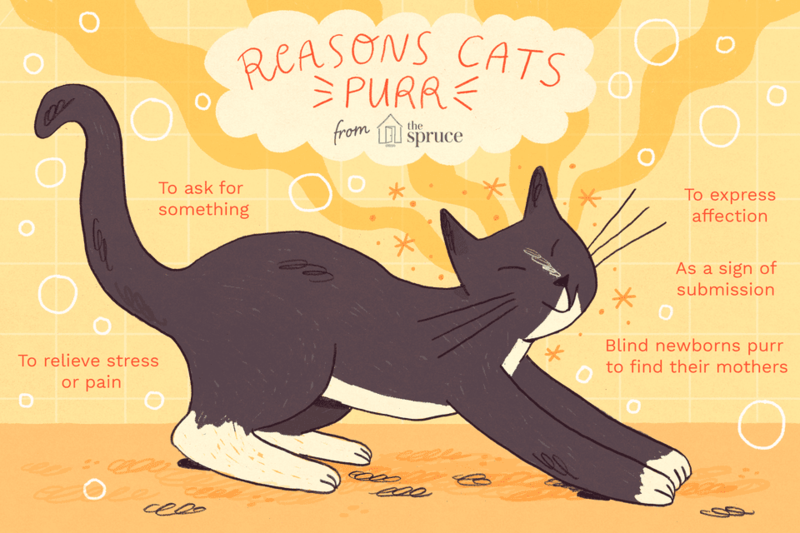 While most people assume the purr serves as an expression of kitty contentment, the mysterious sound — how it's created, and why — isn't that simple. Experts still haven't nailed down the exact mechanism that creates the purr, which happens on both the inhale and exhales for a constant sound. Cats that lose their "meows" (exhale) due to injury are often still able to purr, but cats with laryngeal paralysis lose their purr. It appears that the internal laryngeal muscles, which control the opening and closing of the space between the vocal cords (glottis), creates the purring sound. Studies have shown that this laryngeal muscle movement is controlled by a unique "neural oscillator" in the cat's brain. Watch Now: Why Do Cats Purr? The mother cat's purr serves as a vibration-beacon that tells her blind and deaf newborn kittens her location. Kittens begin to purr back by two days of age. Purring may be a kitten-trait specific to infants that adults retain. The babies often indulge in kneading behavior while they purr. Kittens knead, or tread with the front paws, against Mom-cat's breasts to prompt her milk to flow as they nurse. Adult cats often retain this behavior, particularly when they purr. People often consider purrs to be an expression of affection, and it is clearly a communication tool. Cats and kittens rarely purr when they are alone. Purrs are aimed at other cats or people. The purr has been described as the feline equivalent to a smile, which makes great sense. After all, people smile for all kinds of reasons — happiness, nerves, fear — and a smile (or a purr) doesn't necessarily indicate happiness. Purrs rumble at all sorts of occasions, even when Kitty is frightened or in pain. Some behaviorists suggest that the purr is a sign of submission that signals to the other cats and people that, "I offer no threat" or, "comfort me." That may be why the purr is used both in times of contentment to express joy, and during times of stress to relieve tension. When your cat comes to you with kneading paws and luxurious purrs, perhaps that's her way of calling you "mom." Not all cats purr. That does not mean they are depressed or unhappy. It may simply mean the cat is incredibly well-adjusted and feels no need to purr. In a multi-cat​ household, the most confident cat-in-control may purr less because he's already in charge, while the other kitties purr more in deference to his status. Some scientists theorize the purr also serves as a healing mechanism. According to Scientific American, "Cats purr during both inhalation and exhalation with a consistent pattern and frequency between 25 and 150 Hertz. Various investigators have shown that sound frequencies in this range can improve bone density and promote healing." Feline bones heal much more quickly than other mammals, and in human medicine, the vibration of similar frequency to the purr appears to speed healing. Could the feline purr be an evolutionary asset for our cats? Only small cats have the ability to purr, while big cat relatives like lions are able to roar. Tigers have a kind of "silent" low-frequency purr that is beyond the range of hearing and happens simultaneously with their roar. This mysterious tiger sound has the power to briefly paralyze prey. Our house cats also have a mysterious power-purr. Dr. Karen McComb is the lead author of a study at the University of Sussex in England, that was published in the journal Current Biology in 2009. She identified a "soliciting purr" different than the everyday sound, that had similar frequencies to a crying human baby. This specialized purr with an embedded obnoxious high frequency was found to be used by cats in the study as an effective means to get owners out of bed to fill the food bowl. Apparently, the cry is always at a low level in normal purring, but cats with a close relationship with their owners seem to learn to dramatically exaggerate what prompts a beneficial response in their humans. Smart kitties, eh?! Whatever the cat's reason for the purr, we humans certainly enjoy the sound (except when too early in the morning). The purr is a feline lullaby that soothes the singer as well as the listener's soul.